Heyo, I’m pretty sure it’s just HP MP and Stamina you gotta update here. Also is there any chance you could include Power/Watts for the “online” mode? It doesn’t have any effect on others so it should be fine, right? Edit: My bad, ghost mode and one-hit kills are broken too. The rest still seems fine. want to load it and my pc says ne isn virus O_O ?? Antivirus say almost evey trainer is a virus. Do you really think wemod is going to put a virus in the download ? No not at all. So i guess all the trainers will never be updated. Is this a sign that all of this is dying out? Game has been crashing ever since the most recent update. Is there a way to use the scroll wheel in game without triggering items, fishing line, and xp? It’s driving me bonkers! 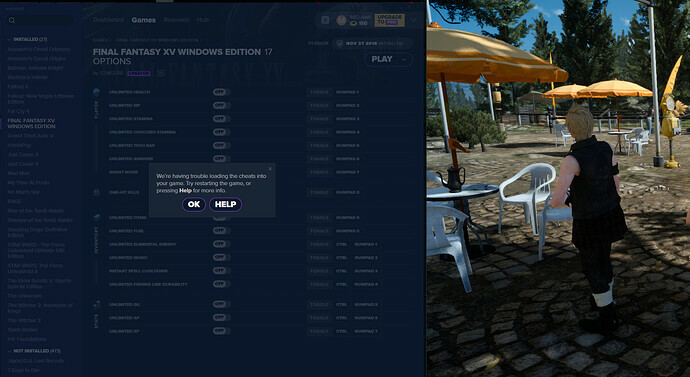 The FINAL FANTASY XV WINDOWS EDITION cheats have been updated! Will it work on the DLCs? eg. Episode Gladiolus, Episode Prompto, etc. If it doesn’t, I hope it will be on the next update. Thanks! When I try, the game never starts. I thought that it was one of the slow loading games and so I walked away and even 30 minutes later it said I was playing but nothing on the screen. Perhaps I amd oing something incorrectly. I tried to launch the game with WeMod, but nothing happened. I tried to start the game from steam then click PLAY from WeMod but nothing hapened. When you manually launched the game and selected play in WeMod, what happens on the WeMod application? Can you take a screenshot of what happens on WeMod? Thanks! Sorry it took so long for me to reply; life.